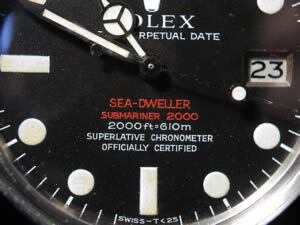 This site is an attempt to give some insights into Rolex Sports watches, with particular interest in the first Rolex ‘Submariner’ sports watches that incorporated a date; the Red Submariner and Red Sea-Dweller. We hope you enjoy browsing through our site, and that you find it both useful and entertaining but please bear in mind that as with all research, there is a caveat; it is neither complete, nor definitive. The information presented here is mostly the result of our own personal study, unless specifically credited to another author, and as such represents the conclusions, insights and opinions that we have formed as a result of that work. We welcome all feedback, be it agreeing or disagreeing, on the site contents as our aim is to enhance our own understanding of this subject and make the site as accurate and relevant as possible for other collectors and enthusiasts like ourselves. Basically we want to know if you have any Rolex related items to sell, so if this applies to you, get in touch, even if the item you are interested in selling is not on the list. 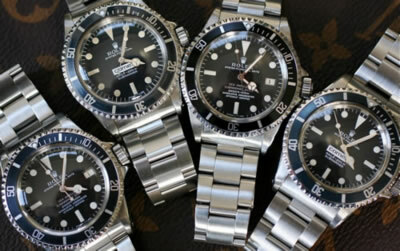 We are always interested to hear from owners of Rolex sport watches, in particular Red Submariners, Red and White 1665 Sea-Dwellers, Comex Submariners/Sea-Dwellers, Military Submariners, as the more information we can piece together, the more accurate our site will become. We would like to thank the many Rolex owners who have already helped us by supplying us with details of their watches and their experiences in this market, and we look forward to hearing the stories of many others, so contact us.